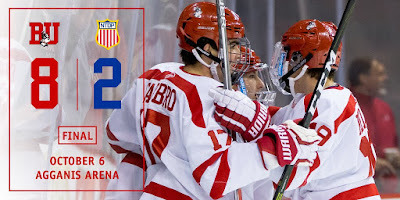 Freshman Patrick Harper continued to wield a hot stick, authoring another hat trick to lead #3/4 BU to an 8-2 win against the NTDP U18s in the Terriers final exhibition game at Agganis Arena. His linemate, sophomore Bobo Carpenter tallied twice and assisted on three goals, while the third member of the first line, Jakob Forsbacka Karlsson, assisted on three goals. Another freshman, Chad Krys, had three helpers just as he did in the PEI exhibition game. As he did in the first exhibition game, Harper initiated the scoring when Clayton Keller sent him in alone. Two minutes later freshman Patrick Curry deflected home a Krys shot after Nikolas Olsson set up the blueliner with a cross-ice pass. Just 93 seconds later, Carpenter scored his first goal, crashing the net to drive home the rebound of a Dante Fabbro blast. 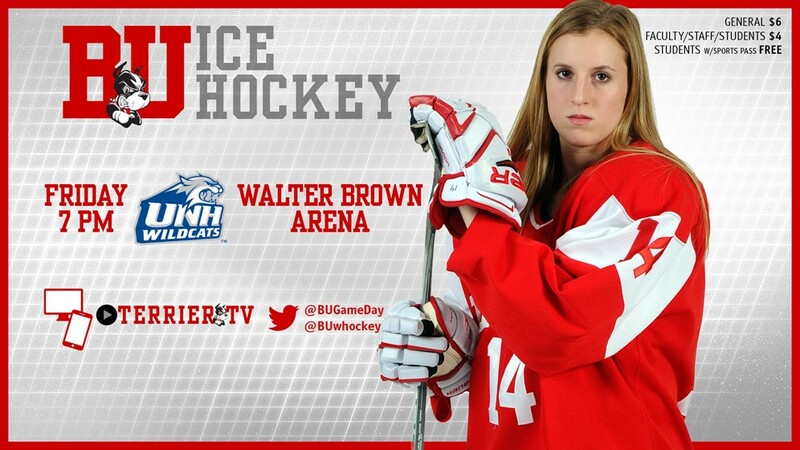 After a U18 shorthander in the final minute, BU led, 3-1, after one period. 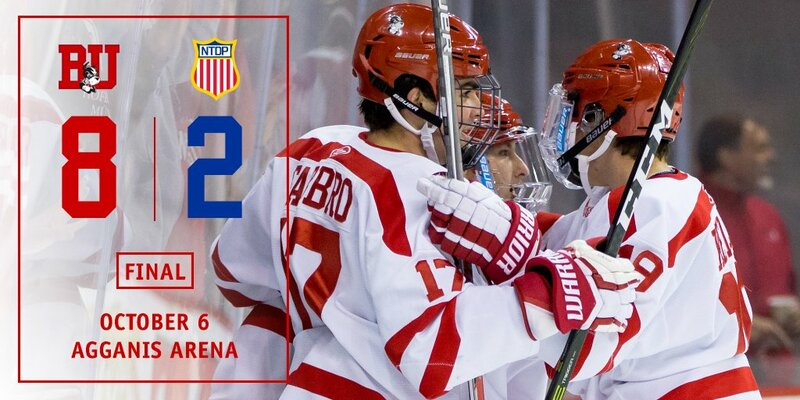 The same script was written in the second period with BU scoring three times and yielding a late shorthander. Harper ripped home a shot from the high slot. Then, on a 2- on-1 breakout, Jordan Greenway set up Keller for a one-timer from the right face-off dot. At the six minute mark, Harper completed his hat trick, converting Carpenter’s centering pass. Harper returned the favor 15 seconds into the third, using a toe-drag move to gain some space, then setting up Carpenter on the door-step to make it 7-2. Fabbro’s blueline blast from Karlsson and Krys closed out the scoring. Terriers dominated in the face-off circling with Karlsson and Keller combining to win 23 of 36 draws. Patrick Harper scored eight goals on 10 shots over the course of @TerrierHockey's 2 exhib. games. Had a hand in 11 of 18 goals. BU begins the regular season on Saturday night, visiting Colgate and its new Class of ’65 Arena for a 6 p.m. ET start. A free live-stream of that game will be available on the Patriot League Network (PLN). ► Inside BU Hockey (audio) begins its season with Bernie Corbett and Coach David Quinn previewing the 2016-17 season. Earlier in the week, Bonino discussed his increased role in the Penguins offense after his strong performance late last season and in Pittsburgh’s run to the Stanley Cup. For BU, which has been idle since defeating Providence, 5-2, on Sept. 25, Senior Samantha Sutherland and sophomore Sammy Davis lead the scoring with three points apiece. UNH comes into the game at 0-2, having lost a pair at Colgate. BU heads to Vermont on Sunday for a 2 p.m. match-up with the Catamounts.